Fast is a relative term. To some people a 9 minute mile pace is fast, to others that same pace may feel slow. That is the great thing about running. No matter how many races you enter, it is always just a race against yourself. The more you run, the more you learn, the more you can improve. I don't run half marathons with hopes that I will come in first place, I'm more likely to win the next Texas jackpot. I will probably never even place in the top 3 of my age group at any race. It is all about beating my own personal record and winning against myself (update to original post: I did once place first in my age group at really small local race.) This is one of the many reasons that I love to run. No matter what your speed, there will always be someone faster and always someone slower. The competition is against yourself. If your goal to become faster, whatever that means to you, I may be able to help. I will share with you how I got faster; Faster than the Lea of six months ago. Faster than I'd even been before. I'd like to share with you how I was able to improve my average comfortable running pace by about a minute and a half per mile (without really trying). Well, I did try. Really hard, actually. When I say 'without really trying,' what I mean is that these are things that I did, that I believe caused me naturally to move faster. I didn't hit the streets and try to run faster, I just got out there and ran, and the result was that my comfortable pace was faster than it ever had been before. I lost the extra weight. When you weigh less, it is easier to move your body faster. I have read that for every pound you lose (that you are overweight), you'll cut about two seconds off of your mile time. So in theory, losing five pounds could shave two minutes off of your half marathon time. Of course, this is only referring to the pounds that you need to lose. Once you are at your healthy desired weight, losing more weight would only make you lose muscle, which would likely make you slower. I run hill repeats. Runners World sometimes makes it sound so technical and complicated. Run up and down a hill. Simple as that. I found a steep hill in my neighborhood that takes me about a minute to run from bottom to top. I sprint up the hill just about as fast as I can go, like there was a grizzly bear chasing me. That would make you run fast, right? When I get to the top of the hill, huffing and puffing, I walk until my breath is mostly recovered and then jog the rest of the way to\the bottom. It takes me about one minute up and two minutes back down. Repeat until you feel like you might die fatigued, then you are done. For me, this was anywhere between 6-10 repeats, building up the repeats each week. Within a couple of weeks I saw improvement in my comfortable average running pace. If you don't have a hill that big, find a smaller one and double the repeats. Any hill will do. I do treadmill intervals, HIIT or high intensity interval training a couple times a week. There are many ways to do interval training, all effective. 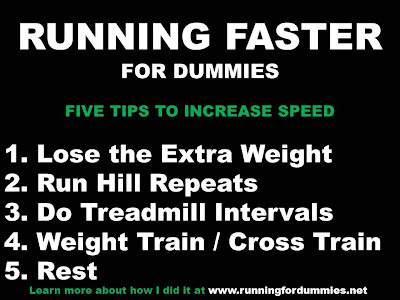 Sometimes I run short fast runs on the dreaded treadmill (the dreadmill). I run my comfortable street pace for the length of one song on my iPod, then for the next song I go a little faster than what is comfortable, and for the third song I go as fast as I think my legs will take me, then I repeat. These runs last between 15-22 minutes and I believe they are very effective in improving street speed. 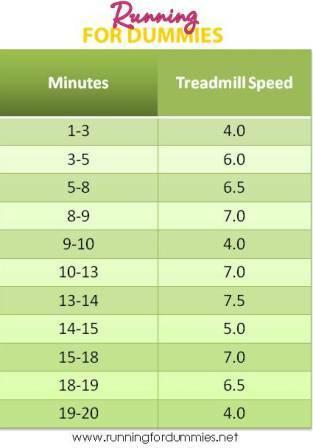 I sometimes do treadmill intervals similar to the one below. This is an example of a middle-of-the-road interval workout. Adjust your speed to your current level. 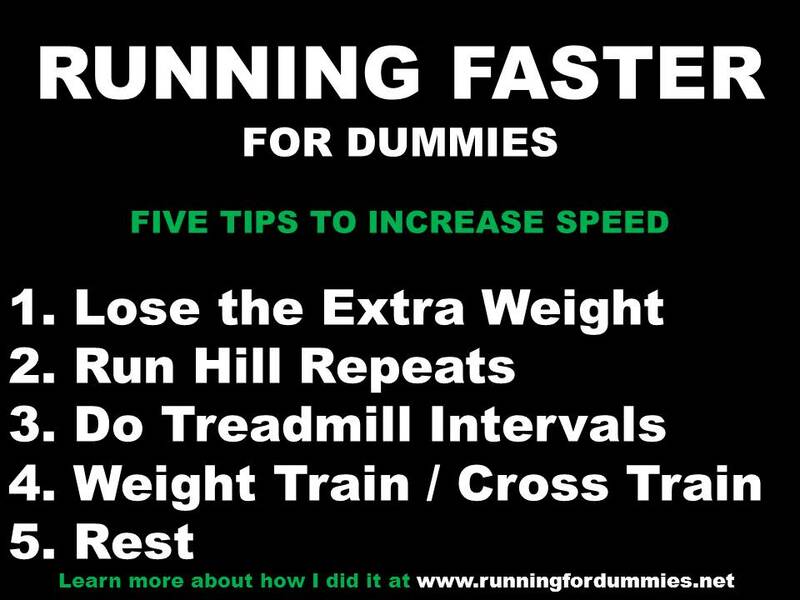 You may need faster intervals, you may need slower ones. It doesn't matter, as long as you are getting your heart rate up and bringing it back down, and pushing the speed outside of your own comfort zone for short periods of time. Consult your Doctor before attempting any new exercise program. Adjust the treadmill speed to fit your current level. I weight train. I saw the biggest improvement in my pace once I started doing serious weight training. When I joined a fitness boot camp at the end of last year, I saw some improvement in speed, but when I stopped going to boot camp and started lifting heavier on my own, I saw the greatest improvement in my pace. Heavy weights make strong legs. Strong legs move you faster. I used to shy away from leg training because I didn't want sore legs to interfere with my running schedule. Turns out the opposite was true. The more I did leg workouts and the less I ran, the faster I became. I started running less. Sounds strange that running less would make you faster, but I do believe it is a piece of the puzzle. I used to run 6 miles a day 5 days a week and a long run on Saturday, logging anywhere between 40-50 miles a week. Since I started weight training, I just didn't have that kind of time for weights and running, so my miles were cut back drastically to about 20-25 a week. I run less than ever, but I am faster than I have ever been. Coincidence? I don't think so. I'm no running expert. I am just a blogging running dummy figuring it all out along the way. These are the things that are currently working for me. 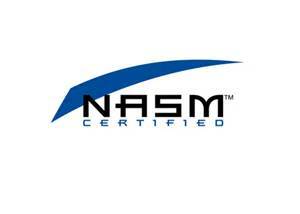 I will continue to strive to improve my training, set new goals and learn new things. 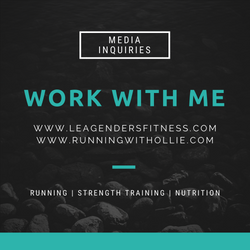 Disclaimer: I am not a doctor, personal trainer, or running coach. I share my personal learning and growth experiences here on this blog. Please do not take any medical advice from bloggers. Please discuss with your doctor before beginning any new exercise program. Thanks for the post! I am not fast or slow but a 10 minute mile would be heaven to me right now. :) I have just recently found a good hill to run so wishing me luck on increasing my speed. Oh and I have incorporated body weight/yoga as well. Good luck! I forgot to mention that I very recently also started incorporating Yoga into my daily routine. 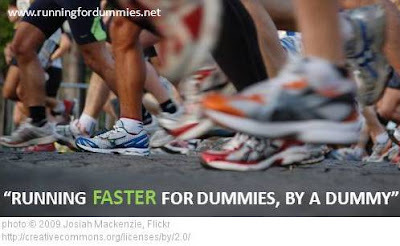 I have read and heard it is supposed to be very beneficial to runners! Good Read! I am recently returning to running. I took about 13 weeks off to do a challenge with some girlfriends (weight training, etc). In that time I lost weight, Body fat % and a few dress sizes! 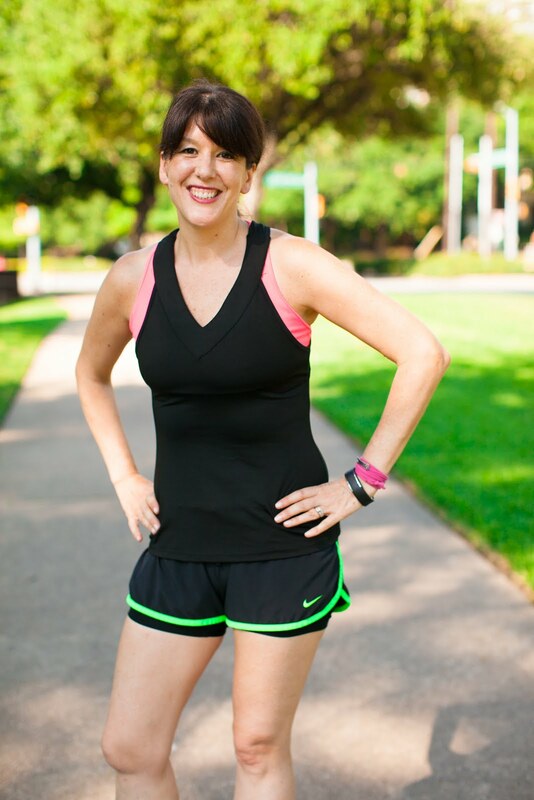 I am really excited to start running again and found this article to be really helpful. I always overthink things but it sounds like I shouldn't. Before taking a break, I was maintaining about an 11 min/pace for 6-7 miles. Will take it slow and hopefully be able to become faster!